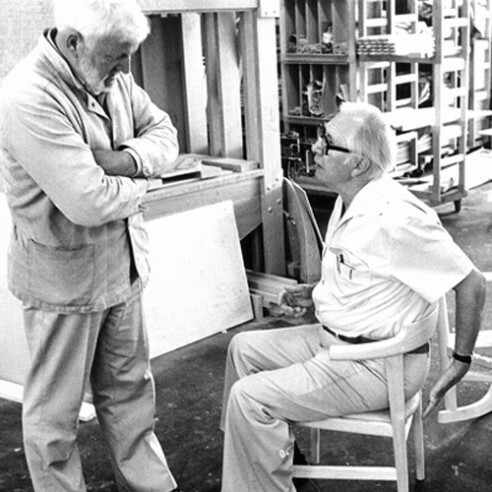 In 1987 aged 73 years old Hans J. Wegner designed his final dining chair and was determined to let all the versions of the design be guided by all he had learnt from his previous works. The Chairs must allow one to sit in alternate positions and be comfortable. The Chairs must allow one to sit in alternate positions and be comfortable.The chairs must provide the correct support for the elbows and the back. The chairs must have plenty of space below the back rest, so as to leave plenty of room for the behind. a table top to assist cleaning. The Final chairs are a descendant of Wegner’s ‘livestock chairs’ such as the Cow Horn and Bull Chairs in that its top rail, besides resembling horns, is shortened so that it can be pushed almost all the way in under a table a space-saving feature even more pronounced in this the chair’s three-legged variant, pp58/3. The chair appears to be light, in spite of it being of solid wood. The appearance a result of the way in which the slightly conical legs taper towards to the upper portion of the back legs where they meet the top rail and the milling out of the top rails mid section where it touches the sitters back. The three legged Final Chair in beech, oak or ash is only available with an upholstered or a veneered seat both of which can be combined with a painted frame. All the paint colours for the chair were chosen in collaboration with Hans J. Wegner’s Design Studio and include ‘Japanese red’, a combination of red and brown which Wegner was personally very fond of.